June 4, 2015 – JTV and The Sam Bernstein Law Firm announce the launch of “Hometown Heroes”, a program designed to honor First Responders in the JTV viewing area who have demonstrated bravery, compassion, courage, dedication and selflessness in the line of duty. JTV will be asking viewers to nominate Hometown Heroes via the station website (www.jtv.tv) during the month of June. A panel of judges will choose five finalists whose stories will be told on the Sam Bernstein Law Firm Facebook page. Viewers and Facebook visitors will then be asked to vote for their favorite Hometown Hero from among the finalists. The top vote-getter will be honored with an appearance on “The Bart Hawley Show” on JTV, a Hometown Heroes award plaque and a contribution of $250 to their favorite charity. Jackson Police Chief Matt Heins, Jackson County Sheriff Steve Rand and Jackson Fire Department Deputy Chief Dave Wooden joined Bernstein in making the announcment. “The men and women of our departments are honored to serve the public. I appreciate the Sam Bernstein Law Firm and JTV for making this fantastic effort to showcase the stories we in our departments hear every day.” said Steve Rand. JTV viewers will be invited to submit nominations beginning June 4 by filling out a nomination form on the station’s website (www.jtv.tv). Later in the month, the selected stories will be posted on The Sam Bernstein Law Firm’s Facebook page for voting. 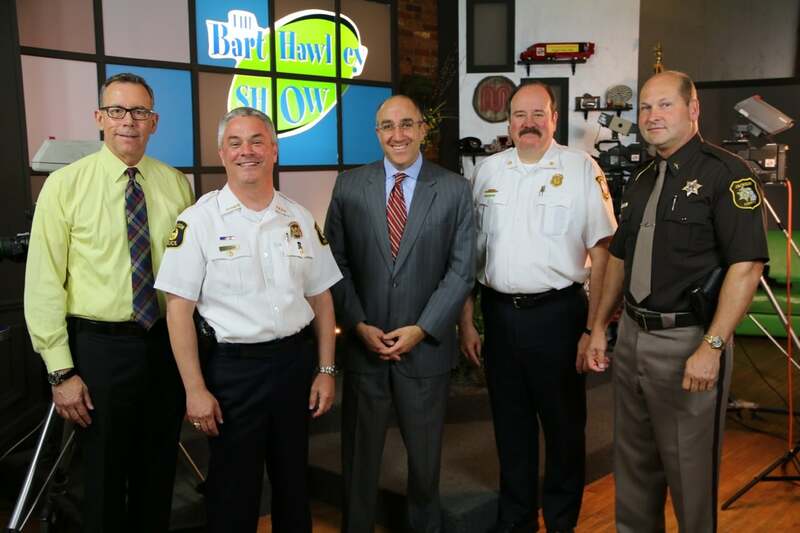 Mark Bernstein is joined by area First Responder department leaders announcing the “Hometown Heroes” program on JTV’s “The Bart Hawley Show”. (L-R: Bart Hawley, Jackson Police Chief Matt Heins, Mark Bernstein, Jackson Fire Department Deputy Chief Dave Wooden, Jackson County Sheriff Steve Rand.